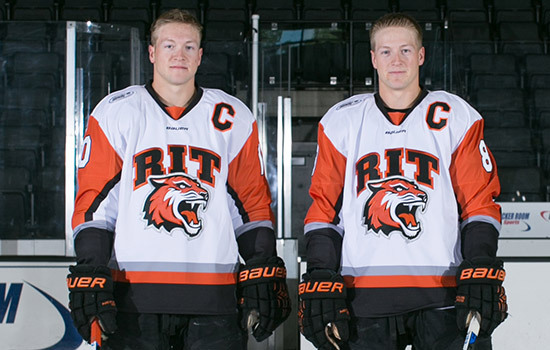 While everyone in the RIT/Rochester hockey community has the men’s hockey contest against Northeastern University circled as the season opener and a hot ticket, fourth-year defensemen, captains and identical twins Brady and Chase Norrish have something else in mind: Relief. Since arriving at RIT in 2014, the duo from Strongfield, Saskatchewan, has helped power the team to two Atlantic Hockey Championships and two NCAA Division I Tournament berths in their first two seasons. In 2014-15, Brady was named to the All-Rookie Team and earned All-Atlantic Hockey third team honors. The following year, Chase was named the Atlantic Hockey Defenseman of the Year and was a first team pick, while Brady was a second-team selection. Last season, the duo was primed to lead RIT to its third straight league title. And as the second half of the season began, the team was near the top of the league standings. Within three weeks, everything changed. On Jan. 14, midway through the third period in a contest at league foe American International, Chase was rushing the puck up the ice before getting innocently bumped into the boards. He’d made this play hundreds of times. But this time, his right knee gave out, and he would need season-ending surgery for a torn ACL. As fate would have it, Brady suffered an identical injury to his left knee in nearly identical fashion three weeks later on Feb. 4 at Robert Morris, requiring surgery and putting a premature end to his season. Despite missing 16 games last season, Brady was named an All-Atlantic Hockey second-team selection. “It was tough to swallow, especially when you want to help your team succeed and it was right around playoff time,” said Brady, a business management major. With both Norrish twins out of the lineup, the Tigers had their season end in the first round of the Atlantic Hockey Tournament for just the second time in 11 seasons. In true Norrish fashion, both were chomping at the bit, ready to help each other get back on the ice. With hard work and the help of Rochester Regional Health’s doctors, along with RIT’s athletic training and strength and conditioning staffs, the duo completed the arduous physical rehabilitation process and are at full strength for their senior seasons. The brothers, healthy and ready to contribute, join 19 returning players, including 12 with NCAA Tournament experience, in their quest to capture a third league title in four seasons. “It’s a sigh of relief to be back and great excitement to be playing again,” said Chase. “It’s great to be back on the ice with the guys,” Brady added.